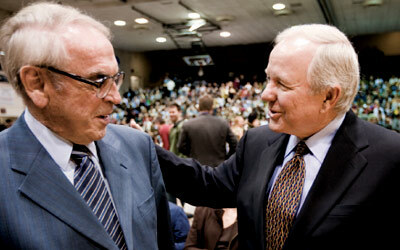 On SPU’s Day of Common Learning, President Eaton (right) greets Jürgen Moltmann, author of Theology of Hope. Moltmann teaches that hope is active, not passive, says Eaton. As I write this column, the news is full of the possibilities of dramatic change. New voices in politics just may be seizing the moment to announce a new day, creating the expectation that, just maybe, the fog of paralyzing polarization, where we have stumbled along for decades, might be lifting. Could that be possible? Is there a new thing coming? The Wall Street Journal reports that people are making their election choices this time less on the candidate’s stand on specific issues and more on the yearning for a leader who might lead us toward something new. Can someone please lead us in the direction of unity, where we might tackle our serious problems together, where we might be locked less into an ideological freeze? I fully realize that all of this just may fizzle in the days ahead, but at the moment everyone seems a bit giddy about a possible new thing in our midst. New things do that to us. And the right leaders with vision can lead us in the direction of something new. But on an even deeper level, I have been thinking about Isaiah’s startling announcement to his people, that despite the troubling, sustained hardship of exile and oppression, God is “about to do something new.” And I have been asking myself how might I carry myself more expectantly, with a posture of anticipation, a posture that is watching, searching, waiting, constantly anticipating that God will do a new thing in our midst, on our campus, even across the globe? As I think about Seattle Pacific, I think this is a posture we so often try to adopt. When I watch our faculty, in pursuit of something new through their research, tracking, exploring, articulating a new way of looking at something, I think this is just that spirit of anticipation. God is just about to open up a new thing. When I see our students, so often confused by the almost unbearable complexity of the world they encounter, discovering a new sense of calling for their lives, a new discovery about how they might use their gifts to impact the world, I say, yes, this is it, this is the posture of anticipation that a new thing is coming. Everyone wants to be part of a new thing, a new day. Oh, yes, to be sure, it is so easy to focus our energies on all that is going wrong, across our nation and our globe, within our communities, and even within our own organizations. As thoughtful people, we are all prone to brood on these things, the big negative things, to focus there and not on those new things that might be breaking into our midst. Too often we miss the new thing that is trying to unfold. The new thing becomes smothered in our pessimism and skepticism. “Stop dwelling on past events/and brooding over days gone by,” Isaiah says. And why? Precisely because God is “about to do a new thing.” Can you imagine that? The spirit of this passage is that we must watch for the new thing. It is just about to flame out, shine through, at any moment. Make sure you don’t miss it. This is what creates hope, doesn’t it? Last summer, I hosted for lunch on our campus Bishop Joab Lohara, one of the strong leaders of the burgeoning Free Methodist Church in India. He said, “God is doing a new thing in the world, and I want to be part of it.” I was impressed by the simple beauty of this expression of hope. Bishop Lohara and his team, even in the midst of enormous challenges of violent persecution and deep-seated poverty, are changing the lives of thousands of people by teaching literacy skills to those condemned by his culture as the untouchables — the very poor, those caught in the cycle of caste from which they expect never to escape. Bishop Lohara is teaching the message of a new day, the gospel of hope. His vision for his people is that a new thing is coming. This reminds me of Gerard Manley Hopkins’ notion that “the world is charged with the grandeur of God.” That’s where this expectancy comes from. That’s where hope comes from. “There lives the dearest freshness deep down things,” says Hopkins so eloquently, and at any moment, that freshness, that newness, will flame out, when least expected. Can a university change the world? That’s a question we keep asking ourselves on campus. Not by “brooding over days gone by,” just the place we are likely to grow cynical. No, we can offer hope by watching intently for just where God’s new thing will break out into our midst, by following the clues, by searching for the signs, by shining the light on those places where God’s freshness of purpose and hope break out. Such watching and searching will take us to places all over the globe, to just where God is doing a new thing. That’s the place we want to focus our work and energies at Seattle Pacific. Along with Bishop Lohara, Gerard Manley Hopkins, and Jürgen Moltmann — and my grandson Elliot — this is what we are waiting for. We want to be part of this new thing God is doing in the world. And we are!